We are often asked about how V got diagnosed with Diabetes. What symptoms did she have? How did we know what was happening? The truth it that we had no idea, and it boiled down to being in the right place at the right time. This is our D-Day story. On May 22nd, 2013, I took V for her regularly scheduled well-child visit with her pediatrician. I expected it to be just like any other visit: check vitals, ask a few questions, get out quickly. We had a couple of questions to address. V had been complaining of pain while urinating for a couple of weeks, but I expected it to have a simple and quick resolution. I was also curious about her dry and bumpy skin but was mainly interested in finding out if we should be applying a lotion, as opposed to worrying about it being a symptom of something. I never thought there would be more to our visit, as overall V seemed healthy and well. When V stepped on the scale, she weighed 10 lbs less than 3 or 4 months prior. This was concerning to us, as we thought V was losing weight, and the scale confirmed that she indeed lost quite a bit. The pediatrician calmly listened to our questions and concerns. Dry and bumpy skin was normal, she said. She had a fancy medical jargon name for it which I do not remember. The downward trajectory of the weight was definitely something to investigate but not necessarily a problem. The pain during urination may be a sign of an infection, so she recommended we start with a urine test to rule it out. About ten minutes later the pediatrician came back into the room. “We have an answer. Her sugar in the urine is well over 300. It is Diabetes, most likely Type 1. You will need to go to Children’s Hospital straight from here.” I processed very little of what she said. I assumed that we would need an immediate consult with a specialist in the outpatient clinic but the pediatrician corrected me that V would need to be inpatient. I did not understand why but followed her instructions. As the pediatrician got on the phone to make arrangements, I started to realize that this was serious. Perhaps it was a blessing that I knew nothing about T1D at that point, so I did not even know what to worry about. I was also in such a state of shock that there was no room to worry. The pediatrician talked to us a little more and explained what would happen next. She was calm and reassuring, but the details of that conversation escape me. I do think she talked to us about T1D as something manageable and that V would be OK. We waited for a little while while arrangements were being made. Then it turned out that the bed at the hospital would not be ready right away, so we were told to get some labs STAT and then go home and wait for the phone call from the hospital. I texted and called my husband in the middle of all this to keep him in the loop. It was all very surreal. I took V to a nearby hospital to get the labs done and we were driving home when we received the phone call from the hospital: her bed was ready. I asked if we should turn around and come straight away but they told me to go home and pack. “You will be here for a while”, they said. I still did not understand why it was necessary. Why couldn’t they just explain to us what to do at the outpatient clinic? At home we ate lunch (what the heck do I feed my child if she has Diabetes? I had no idea so we just finished the leftover lasagna). I packed our essentials and jumped in the shower. As I got out of the shower I noticed there was a voice mail from our son’s preschool. He spiked a fever there, even though he seemed perfectly well in the afternoon. Instead of coming to the hospital with us, my husband had to pick up our son from preschool and stay home with him. Once we finally got to the hospital and checked in, we were bombarded with information. They reviewed the labs and did another draw. The labs from earlier in the day had BG of over 500. V’s BG at Children’s was 737. Yes, I am talking about blood sugar, not about an airplane. Once we learned about ketones, basics of diabetes management, risks of high BG, dangers of low BG, and how much there was to learn, I finally understood why this could not have been handled on an outpatient basis. At some point I had a few moments to sit down and collect my thoughts. We felt completely blindsided by T1D diagnosis. And yet, all the signs were there. V was drinking an excessive amount of water. But our kids normally drink a lot of water, and it was getting warmer, and she is very active, so it seemed normal. She was getting more tired, but we thought that it was because she was extra active, and because it was warmer. She was going through pretty bad mood swings at home, especially when hungry. But we thought it was just her growing up, a sign of what’s to come in adolescence. We noticed that V was getting very skinny. But she was hit with a flu and a stomach bug almost back to back around February and lost a lot of weight then, so that could explain why she was still so thin (even though we started to grown concerned that she appeared to be losing weight instead of gaining it back). The pain during urination was puzzling but not too concerning because it was not constant and did not seem severe. And otherwise V appeared totally healthy and fine. I remember that a thought of Diabetes briefly crossed my mind once but I shrugged it off immediately as impossible. Wouldn’t she be sicker, and wouldn’t she be gaining weight as opposed to losing it? Yes, complete and total ignorance of T1D. Even her dry and bumpy skin turned out to be a direct reaction to high blood sugar. Once her BG was more stabilized her skin improved a great deal. All of the classic symptoms of T1D were unfolding right in front of our eyes and yet we completely blew it because we did not know. We were very lucky that V just happened to have a scheduled doctor’s appointment at the right time and got the correct diagnosis right away. Had we waited longer, it would have been worse, a lot worse. 1. V CAN have sugar. She just needs to give herself insulin. In fact, sugar is not a concern in and of itself, it’s the amount of carbohydrates that we need to know about in order to dose insulin correctly. You can read one of my earlier posts here to learn about carbs and Diabetes. Since it’s all about carbs, sugar-free food does not equal carb-free food. Besides, who needs all those chemicals anyway? 2. For some strange reason, people are compelled to give us unsolicited advice* upon hearing that we have a child with T1D and Celiac. Pregnant women and people with Diabetes are like giant magnets for unsolicited comments. (I don’t even want to think about poor pregnant women who also happen to have Diabetes!) I will be honest with you: unsolicited advice is unwelcome. Most of the time people don’t really know what they are talking about, even if they mean well. And there are some people who say really stupid things. *I want to clarify that unsolicited advice is not the same as having a conversation, asking questions, and sharing resources that we can explore on our own time. Please always feel free to ask us questions and talk to us about our T1D and gluten-free life. 2. As of right now, there is no cure for Type 1 Diabetes and insulin is the only treatment. Some individuals get misdiagnosed; others may experience prolonged honeymoon periods and may not need insulin for a period of time; yet others adhere to very strict diets that help reduce the amount of insulin needed. But miracle diets and exercise cannot fix a broken pancreas, nor can shamans, snake oil, cinnamon, denial or wishful thinking. You may have heard of Diabetes being cured in mice and dogs. It’s great for mice and dogs but does not help humans. 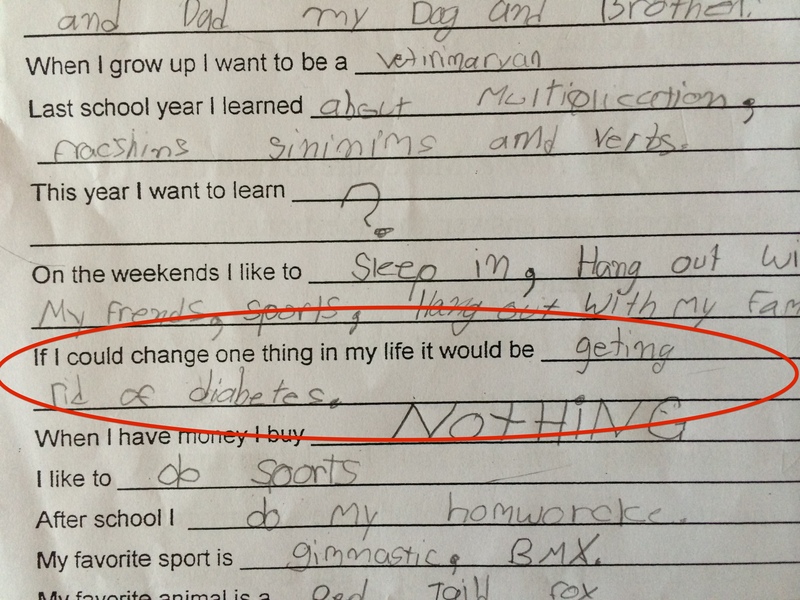 Also, one never outgrows T1D. It is a life-long illness, until there is a cure. 3. T1D is invisible but omnipresent. It requires 24/7 management and never gives us a break. We are always aware of it and always thinking of it. V pokes her fingers to check BG 6-10 times a day. In case you are wondering, it hurts. 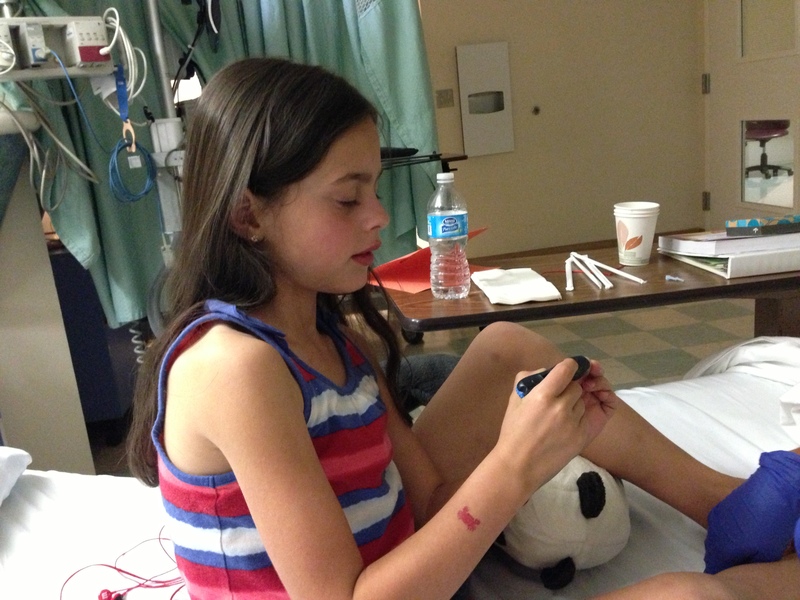 Changing her pump site or inserting a new CGM sensor hurts too. It is exhausting, stressful, and affects everyone in the family. We’ve mastered BG management enough to sometimes make it look easy. We don’t want to overplay it either. It is our new normal and we do what we need to do every day. But it’s never easy. 4. We are not worriers, and we are greatly comforted by knowing that T1D is manageable and that V can have a normal life. But we are also well aware of Dead in Bed Syndrome. We have gotten up in the middle of the night to make sure V is breathing and alive. Dead in bed is scary and real. No, most of the time we don’t think about it, but sometimes we can’t help but go “there”. I don’t want to bring your attention to it to scare you, but to underscore the seriousness of this illness. I also realize that after reading this our friends may never again be comfortable or willing to have V over for a sleepover. 5. Celiac desease is not an allergy. It is an autoimmune disorder, much like Diabetes. There is no known cause. V will not have an anaphylactic reaction if she ingests gluten. In fact, she may have no symptoms at all, although in all likelehood she will have an upset stomach or mild nausea a few hours or a day later. However, any exposure to gluten leads to damage in the small intestine, so naturally we want to minimize cross-contamination and prevent exposure. 6. V is not a poor sick child. We don’t see her that way. She does not see herself that way either. Yes, she has serious dietary restrictions and a medical condition that requires constant attention. And yes, sometimes her Diabetes or Celiac make her feel sick or more susceptible to illness. She may need to stop and re-group sometimes, but day to day, it does not stop her from living a normal life. She is strong and resilient. She does not need special treatment, only thoughtfulness and consideration that you would extend to anyone else. 7. We are deeply grateful for everyone’s consideration, thoughtfulness and support. We have many wonderful friends who offer their support, go above and beyond to accommodate V’s needs for both T1D and Celiac when we gather together, and help her feel normal and included. Words cannot adequately express how much we appreciate it. 8. We are grateful that for now V has the “good” kind of “bad” diabetes. Her BG tends to stay stable through the night. There are very few unexplained lows, nor had she (yet) had a really bad low. Sure, she is usually on a BG roller-coaster, but it’s not as bad as what some other kids experience. She is not prone to developing ketones when she is sick or running high. It can all change at any moment. As she is growing, the changes and the hormones can wreak havoc with BG and we are bracing for what may happen in the future. However, right now we are grateful for any type of stability we can get. 9. We are grateful to be living in a time of increased Celiac awareness. There are so many GF options everywhere. GF diet nowadays is easier than ever, even if compared to just a few years ago. As much as the GF fad makes us cringe, we have to admit that it brought us many benefits and we hope that even when the fad fades away, GF awareness is here to stay. 10. We really, really want a cure for both Diabetes and Celiac. However, when push comes to shove, we want the cure for Diabetes first. Celiac is hands down the lesser of the two evil. I will end by posting a picture of an “about me” assignment V completed this week.